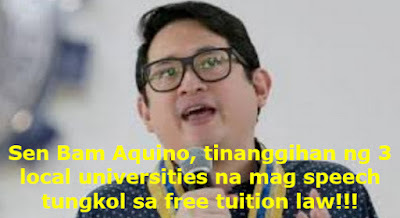 Three local universities have rejected the request of Senator Bam Aquino to be their resource speaker. Apparently, the Liberal Party senator has been visiting state colleges and local universities all over the country to discuss the Republic Act No. 10931, also known as Universal Access to Quality Tertiary Education Act of 2017 to the students. “We have no choice but to reject Sen. Bam’s request to be our resource speaker. First of all, the letter of request from his office stated that the senator wish to visit us on Monday, March 26, which falls on Holy Monday, and we have no classes that day.” A certain Jed, a school administrator of a local university in Batangas told local reporters. “Well, we still have to ask the students if they like to hear the senator speak to them. I think the free tuition law is already clear to them. We have campaigns on this inside the campus and on social media.” Jed, who did not give his full name, replied when asked what if Sen. Bam will make another request, and the date will fall on regular classes. Meanwhile, the school administrator added that two other local universities also rejected Sen. Bam’s request. According to him, the content of the letter of request is almost at the same except for the dates – March 27 (Holy Tuesday) for another local university in Batangas and March 28 (Wednesday) for a local university in Laguna. According to Commission on Higher Education (CHED), there are now 112 State Universities and Colleges (SUCs) and 78 Local Universities and Colleges (LUCs) that offer free tuition for the school year 2018-19, under the free tuition law, which President Rodrigo Duterte approved on August 3, 2017. LUCs are described as educational institutions created by local government units through ordinances and other enabling acts. The free tuition law covers 8 SUCs in Metro Manila, 49 in the rest of Luzon, 26 in the Visayas, and 31 in Mindanao. There are actually 112 SUCs, but one of them in Mindanao has 2 campuses, which were specified separately. SUCs are automatically covered by the said law, while LUCs still need to pass the evaluation of CHED.